The Premiere Boat Repair Company in Minnesota is Anchor Marine Repair. We love boats and it shows in our commitment to repairing and renovating all types of MN boats. You can trust your prized marine craft to a team of technicians with a combined 45 Years of Experience with boat repair. There are just too many things that can go wrong if you take your boat to a company that lacks knowledge and experience. Anchor Marine Repair is Insurance Approved Boat Repair Company for both Accidents and Storm Damage Repair. At Anchor Marine Repair, we Repair, Rejuvenate and Renovate boats. 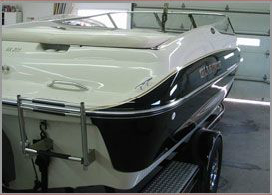 Our expert services include repairing Aluminum Boats, Fiberglass Boats and Pontoon Boats from all around Minnesota. There is artistry involved in almost all aspects of boat repair. Skilled technicians utilize the latest technology to achieve near perfect results in Storm Damage and Accidents repair work. Anchor Marine Repair takes the time to do it right for flawless results. 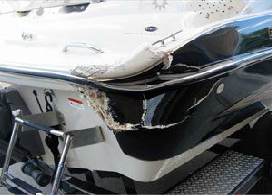 Our boat repair services can take a very damaged boat and restore it to pre-accident condition much faster than you may think. Our 10,000 square foot facility at Anchor Marine Repair boasts 2 spray booths that can have your boat looking as good as, if not better than new. We equip our technicians with the finest technology aimed at completing the most difficult repair jobs quickly. Our State of the Art Boat Repair Facility can accommodate boats up to 38 feet long. You can rest assured that your boat is in expert hands. Anchor Marine Repair treats every boat like it is someone’s treasure. We strive for excellence in Boat Repair and Restoration work. Our crew is passionate about boats. Every member of out repair team has been with Anchor Marine Repair for at least 10 years. We are an Insurance Approved Boat Repair Company that provides outstanding Storm Damage Repair as well as repairs for Accidents. We are proud to provide Top Quality at Affordable Prices.